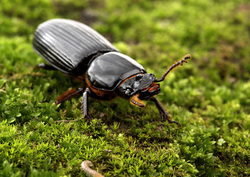 The Bess Beetle is an invertebrate which means it has no backbone. It is classified in a group called Insects. These kinds of animals have three body parts, head, thorax, and abdomen. The Bess Beetle's unique structures perform many functions. The beetle has 3 body parts, the head, thorax, and abdomen. The Bess Beetle has 2 sections of its thorax. The two sections let it move more freely. The Bess Beetle has tiny gold fringe. They might help keep the Bess Beetle clean but it is not for sure. The Bess Beetle has something called an elytra. This helps protect the hind wings. They have things called mandibles that serve as jaws. These help the Bess Beetle eat.